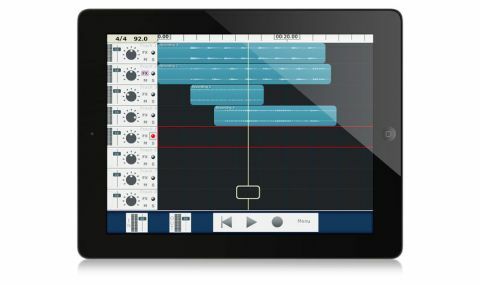 Competition among iOS DAWs is only going to get hotter, but the MultiTrack DAW offers ease of use and value for money. Inexpensive. Useful range of facilities. Auto punch-in. Full 24 tracks requires in-app purchase. The number of recording applications available for iOS continues to expand, and one that provides plenty of capability without breaking the bank is Harmonicdog's MultiTrack DAW, for iPhone, iPod touch and iPad. "Mixing facilities include EQ and compression for each track, with reverb and delay available as send and return effects"
It offers playback of a full 24 stereo tracks with a sound quality of up to 24-bit, 96kHz, depending on whether your audio interface supports that. For your money, you get just eight stereo tracks, but you can add the rest later as an in-app purchase (£5.49). With the software's metronome available as a timing guide, you can record two tracks simultaneously on an iPod or iPhone, and up to eight tracks on an iPad. There are plenty of audio editing functions, and the mixing facilities include EQ and compression for each track, with reverb and delay available as send and return effects. For the final polish, there's more EQ and compression in a mastering section. Individual tracks or final mixes can be transferred to computer via Wi-Fi, and you can use iTunes File Sharing for mixdowns and to import audio. Overall, the app is easy to use, with simple touch gestures. It's great for quickly putting parts together, and has a hands-free automatic punch in and out capability that should appeal to guitar players.